Dave Stroud was my first singing teaching mentor. he has been instrumental in helping me not only to be a the best voice teacher I can be but also in helping me get the right mindset for building a successful tracking studio. Dave is here with one of his artists, Daniel Bedingfield, to present a masterclass to singers on Sept 2nd (click HERE for more info) and he has agreed to also run a couple of teacher training workshops in London. If you are the kind of teacher who is into professional development and who wants to gather as much knowledge as possible about the voice and teaching singers then you will love the info you get from attending one or both of these workshops. Dave always inspires, educates and pushes teachers to teaching to their best. Content: Assessing the voice quickly and accurately, the best exercises to address an individual’s vocal issues, how to apply all that into song, the art of communication, practical demonstrations, Q&A. Who is this for? : Anyone who has already started on the path to being a singing teacher 1-2 years, and wants to hone their skills and become more a more effective and efficient teacher. Title: The Mix, fact or fiction? Content: What is the mix? Does it actually exist as a vocal quality? What is really happening as the voice transitions between the registers? Practical demonstrations and teaching clinic, Q&A. Who is this for? : This class is for teachers who have been working for a couple of years or more and wish understand the transition between the voices from a vocal science point of view. There will be discussions based around vocal science and formants during this class, so a bit vocally nerdy if we are honest! Further info or to book a place email info@shedlightevents.com. Please include a contact telephone number, the workshop/s you wish to attend and if you wish to have a private lesson what day/times suit. Dave’s clients include Natasha Bedingfield, Daniel Bedingfield, Adam Lambert, Jordin Sparks, Frank Oceans and Ben Folds to name a few. Jordin Sparks recently revealed that Dave saved her voice in 2010. He has a very busy teaching studio in Hollywood, LA where he sees singers of all levels and backgrounds from ‘stars’ to working singers to those who just want to get better so they can enjoy singing. He has always been fascinated with the art of teaching singers not only from a technical angle but also in how we communicate as teachers in order to bring out the best in a singer’s voice and performance. Dave is committed to helping singing teachers develop their teaching skills and understanding of the voice so they can deliver fantastic and rewarding voice lessons to their students. 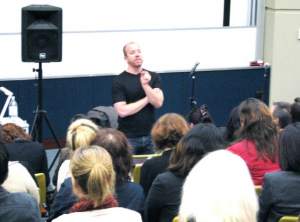 He has lectured and taught hundreds maybe even thousands of singing teachers around the world. He not only educates but has also had extensive experience in developing programs that educate and train those interested in becoming the best singing teacher they can be. Dave has recently set up an organisation for singing teachers who are unified in the technique they teach and aspire to the same high teaching principals and values. This organisation is called Vocology in Practice (ViP). ViP teachers use a teaching system that is not only endorsed by major recording artists but also vetted by the world’s leading authorities on vocal science and education. The goal of the technique used by ViP teachers is to balance the voice through all registers (from bottom to top) building strength, flexibility, and a tension-free voice over an exceptionally wide range. ViP teachers receive education from leading voice teachers and scientists around the world. Technical and teaching practices are overseen by an advisory board made up of educators, leading vocal coaches and voice scientists. Within ViP is a community of like minded teachers who love to grow and develop as teachers and singers and share their experiences and knowledge with others. More of this exciting development will be announced in the next month or so.